I am an eternal optimist. Depending on whether you share my outlook, you will either think this is a blessing of a curse. I always tend to look on the bright side and I always think that the next 12 months will be better than the last. Even in the face of a few knocks, I tend to dust myself off, take a deep breath and carry on. This is the year I started this blog. I already had a blog on finextra.com and an internal blog with my employer, but I set this up as a playground to write what I wanted and hopefully improve my writing skills. After 8 months, 123 blog posts, an estimated 60,000 words, 100 comments and 300 likes has it been a success? The fact that I still love blogging is a good sign. In general, my interests tend to have a short, intensive life before they burn out in a fit of apathy. The only exception up until now was playing games which has lasted for decades. I am glad to have doubled my hobbies. In general, I spend about 6 hours a week writing blogs (and probably the same again thinking about what I’m going to write). Although I’m probably not the best judge, I feel that my writing has improved. The style checker used to have a field day underlining my initial efforts. These days, there are fewer suggestions for improvement. Whereas I used to struggle with the dreaded passive voice, these days I now understand what it is, instinctively avoid it and I’m comfortable with where I use it – something I never thought I’d get the hang of. WordPress is an amazing platform. The way they use game mechanics to encourage bloggers to keep going is a brilliant piece of design. I still get excited when I receive notifications. It is also an unbeatable way of finding other interesting blogs to read on a diverse set of subjects. Everything I read about being a good writer tells me that I should read more. I’ve read more books this year than ever and it does help with both style and imagination. I’ve been careful to challenge myself with what i read as well – avoiding the usual tropes and going for books I would not have chosen before. So what next? I would like to have a go at something a little more substantial – a novella perhaps rather than a short story. Hopefully that will be the stepping stone up to a book of some description. I would also like to have a go at getting something professionally published. Although I have dabbled this year, I will make a more concerted effort in the next 12 months. I would like to thank all those who take the time to read my posts. To those who go further and make comments, click on the like button or share my posts with a wider audience – I appreciate it. Have a great Christmas and here’s to a great next 12 months. My wife thinks I’m crackers, but I am glued to the stats that get produced from the two blogging platforms I use. When I post something, I want to know that someone has read it. Not just that – I want to know that they have enjoyed reading it. Not just that – I want to know that my readership is increasing and not declining. A neutral observer might say I am obsessed. As a blogging platform, WordPress provides excellent stats. The way that they have used game mechanics in the blogging dashboard is first class, and I feel that they must share some of the responsibility for my obsession. There is a little tiny notifications icon in the top right hand corner. When your blog achieves something, that beautiful little icon slowly starts to glow, and almost in perfect time, I start to smile with it. 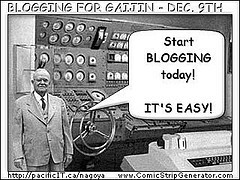 However good the blogging stats are on WordPress, they are not perfect. I find that sometimes I get a like when the number of page hits doesn’t go up. Sometimes, the counters get out of sync’ but no matter, they are still a useful barometer of activity on your blog. When I get a follower, my heart soars – someone has subscribed to my random musings – I must be doing something right. When I get a “Like” on one of my posts, I cannot help but smile. When I post something and nothing happens, I descend into misery. But then that little notification icon glows slowly into life and I am bouncing off the walls again – such is the bipolar life of a blogger. I find that I am not the best judge of my writing. Some of the work that I am most proud of has fewer “Likes” than some of the work that I’m maybe less proud of. But whichever way you cut it, all feedback is good. When people take the time to comment on one of my posts, I love to see their perspective. Somehow I haven’t managed to inspire the level of engagement of some of the blogs I admire, but any comments are a start. I find that being part of the blogging community myself has changed my behaviour when reading other people’s blogs. Where I read a blog now, I look for some way to give the author feedback. I know how much it means to them to know that someone is out there and they care about what they are reading. I would urge you to do the same. If you read some good work – congratulate the author. If you disagree with what you read, comment and argue your point. If you don’t like what you read, give feedback (but please be gentle). Whatever you do – don’t play possum. Anyone who sets up a personal blog under a domain name wants something that is relevant and obviously available to buy. Availability of good domain names has diminished as the web has grown, so it’s always a struggle to fine something that you like. I have always had a fascination for all things nautical, and this is reflected in the clothes I choose to wear. It is rare to see me out of a blazer and a pair of blue deck shoes, so I was delighted when I found the domain available. I don’t know what it is about boats, but my fascination began at an early age. As children, we were ferried across to Ireland at least once a year in order to see the family. I found the whole journey totally absorbing. There is nothing quite like the feeling of standing on deck watching the dock workers untether the various mooring lines and see the ship ease away from the dock. I remember the crossings were always very rough. My mum would start to be sick the second the ship passed the harbour wall at Holyhead, and she wouldn’t stop until the ship passed the harbour wall at the other end. She wasn’t alone. One thing you learnt on these crossings was to make sure that you used the toilets early in the voyage, because at the end, you would be paddling in the unmentionable. I used to like standing on deck during the rough weather. I loved to watch the big waves as they crashed over the ship. The sheer power on the sea was awesome as massive peaks and crests appeared in the sea. The way you needed to lean as you stood in order to remain upright made me smile every time. I carried this love on into my adult life. My wife and I have been lucky enough to have travelled on a number of cruises all over the world. We even owned a small boat on the Thames for about 4 years. At one point in my life, I very nearly joined the Navy. What a different life it might have been! 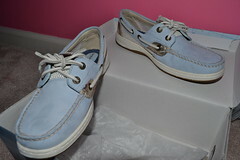 So when you look down at my feet and you see a pair of blue deck shoes – that’s the reason why!